The rib cage protects all our cardiovascular system. There are 12 ribs on each side of the thoracic cavity. There are cases when we might experience pain under the right rib cage that can range from mild to severe. This might be worrisome and sometimes can be an alarming situation since we do not know what is actually happening. 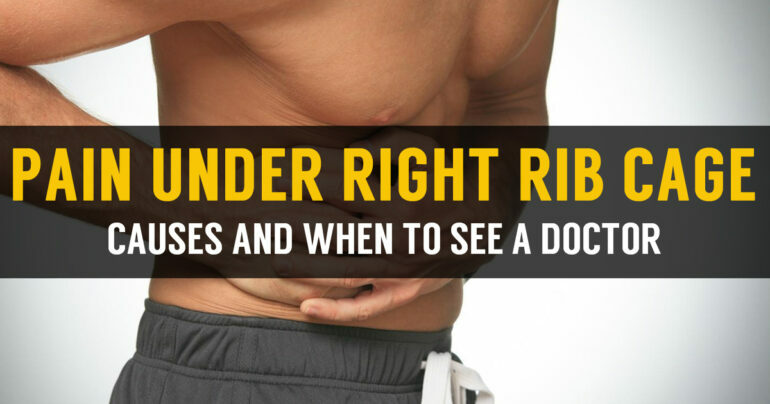 Sometimes, a pain in under the right rib can be caused by a bad position while sitting or standing, or even laid on the bed; while there are some other times when it can be a more serious situation that can lead to an emergency. A lot of delicate organs are protected by the rib cage, so we should never overlook any sudden pain that is produced under the rib cage. If experiencing intense pain under the right rib cage, the first thing that comes to some peoples’ minds is heart attack. However, it has come of great importance to point out that it is rarely that pain under the rib is considered to be due to heart attack. Nevertheless, it is imperative to go see a specialist if you are experiencing a deep pain under the rib cage. The Doctor will accurately tell you what the problem is and if there are any problems at all. Here, we will be discussing what a pain under the right rib might be telling us. • Pregnancy: Pain manifested in the rib cage can definitely become an issue. Especially in the third trimester. You may feel a little sore and wounded on the cage rib. You will more likely feel pain on both the left and the right side of the rib cage. As the uterus develops and your pregnancy advances, you will also present pain under and in the rib cage. Later on, your belly stretches as the uterus grows outward and upward causing these pains. • Strained intercostal muscle: the intercostal muscles are located between ribs attaching them to each other. There are 11 intercostal muscles in each side of the rib cage. These muscles stretch and contract when you breathe, so when there is restraint or soreness, you are very likely to feel pain in the cage rib. • Gallstones: They are created in the gallbladder and move into its ducks. This also causes pain under the right rib cage. Some other symptoms of gallstones are rapid heartbeat, vomiting nausea, and fever. The pain usually goes across from the rib cage to the shoulders; this is called a bladder attack. • Costochondritis: It is the infection, inflammation or swelling of the cartilage in the rib cage that connects ribs to the breastbone. It produces pain under the right rib cage. • There a lot other diseases that can cause pain in the rib cage like: Appendicitis, pancreatitis, and liver damage. This is way its so important not to overlook deep pain under the right rib cage.